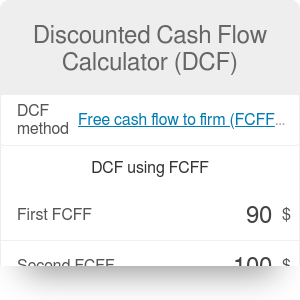 This discounted cash flow calculator (or DCF calculator for short) provides you with a simple method of company valuation. With just a few clicks, you will be able to estimate how much a startup is worth and whether it makes sense to invest in it. If you're not sure how to calculate the discounted cash flow or what it is, make sure to scroll down for a detailed explanation, including the DCF formula. If your early-stage startup doesn't bring any profit yet, check out our break even calculator instead! First of all, you have to project cash flows for the next couple of years. It is usually done by estimating the growth rate of the company - for example, you assume that each year will bring a 15% increase in the company value. In the second step, the cash flow estimates are discounted using an annual discount rate. This calculation reflects the change in the value of your money. Consider this example: $100 today is not an equivalent of $100 in three years from now - after all, you could put it in a savings account, where its value would steadily increase. The discount rate is usually assumed to be equal to WACC (Weighted Average Cost of Capital). In the next step, you need to estimate the terminal value of your company. Usually, you won't assume that your startup grows at a steady rate for infinity. Instead, you have to assume a lower growth rate, called the terminal growth rate, to show that growth is slowing down. Basing on that number, you will estimate the increase in your company's value from the end of the growth phase to the end of the startup's existence. Finally, the result (called the total intrinsic value) has to be compared with the amount of money you want to invest. If the intrinsic value is higher, it means that the returns from the investment exceed the costs. If, on the other hand, the intrinsic value is lower, the investment will (most likely) never pay off. Now that you understand the principle of DCF valuation, it's high time to introduce the DCF formula! n is the number of years when your startup is growing at a growth rate g.
i is the number of years in terminal growth. Uff, that was a lot of formulas! Let's look at an example to understand the principles governing the DCF valuation. You are an investor and want to buy shares in a startup, paying $300 per share. During the last 12 months, the startup's earnings per share were at a level of $50. Will your investment pay off? The first thing you do is ask the startup about their projected growth. The CEO is confident that they will be able to achieve stable growth of 8% annually for the next five years. The next step is the evaluation of the terminal growth. After some research, you assume that a terminal growth rate of 3% over the following five years seems realistic. Last but not least, you check the average values of WACC and decide to choose 11% as the discount rate. Discounted Cash Flow Calculator (DCF) can be embedded on your website to enrich the content you wrote and make it easier for your visitors to understand your message.